The right window dressings can make a massive difference to the aesthetics of a room. Get it wrong, and the room can look dated, or simply bare. Curtains are by far the most popular form of window dressing, as many people deem them to be superior to blinds. Montreal Soft Velour Lined Pencil Pleat Curtains. Get them here. 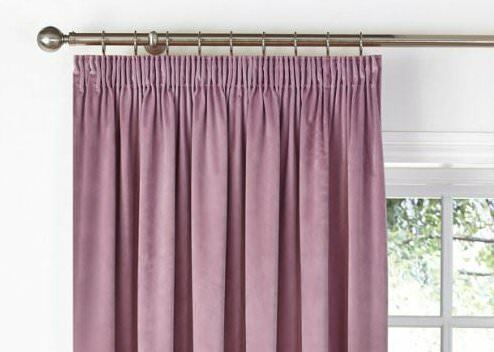 Curtains come in many colours, sizes and consistencies. You’ll want to pick the sort that best match your décor, and the purpose that the room will fulfil. Curtains have four main advantages over blinds. Firstly, most curtains are more effective at blocking out light than most blinds. If this is your main concern, you’ll probably want to invest in blackout curtains. Curtains also retain heat better than blinds, so they’ll reduce your heating bills and keep your home more comfortable in winter. Lastly, curtains diffuse noise in a way that blinds cannot, and increase privacy. Let’s examine each of these benefits in closer detail, and determine exactly which curtains are going to be the best fit for you. For the majority of people, blocking out light is most important in the bedroom – especially for those that work night shifts. However even if you’ve just had a late one the night before, curtains that block out light will allow you to enjoy a lengthy lie-in undisturbed. Blackout curtains can also come in handy in the living room. Total darkness will improve your cinema and gaming experience, while heavier curtains will also improve the acoustics in your room. Many homeowners will invest in multiple sets of curtains, justifying the cost in savings on energy bills. This is sound logic, because curtains really do help prevent heat escaping your home. They partition the cold air around your window from the warm air in the room, and prevent the two from intermingling. Curtains will also help if there are any draughts coming from your windows. So what are the best curtains for heat retention? As a general rule, the heavier the fabric, the better. This is because it will make it more difficult for air to pass through and around the curtains. We offer thermal curtains that have enhanced properties for this purpose, using interlining or specialist coatings. Another, perhaps better answer, pertains to how you actually use your curtains. Leave your curtains open and they won’t do anything to prevent heat escaping your home. Close them, and you’ll be able to retain any heat you’re generating for as long as possible, and take some strain off your boiler. So what about in summer? Can curtains reduce the amount of heat that enters your home? The answer again, is yes. Keep your curtains closed on a hot summer’s day and your home will be cooler. Vibrations in the air can easily pass through solid surfaces like glass, and the wood and metal panels that surround windows and make up Venetian blinds. As such, these materials are poor sound insulators. Fabric, on the other hand, won’t reverberate quite so much. It will absorb some of that sound energy. The denser the fabric, the greater this effect will be. Will curtains reduce noise? The answer is another firm yes. A set of heavy curtains work well when noise pollution is a concern. As mentioned, they’ll also break up natural reflections that might occur in a room, so everything sounds a little softer. Privacy is our final concern – and it’s arguably the most important. After all, energy efficiency is important, but more important is being able to get changed and go to bed without displaying all to the street. Some curtains let in light but still allow privacy. Voile or net curtains are examples of privacy curtains that still let light in. These types of curtains are especially useful in bathrooms; especially if combined with frosted glass. They’re also lightweight enough that they won’t absorb airborne moisture in the same way that heavier fabrics will, which is really important in moisture-heavy rooms like bathrooms and kitchens. Lightweight curtains of this type also offer the advantage of being very thin. This means they can be placed underneath another set of heavier curtains. This provides the best of both worlds – if you need natural light and privacy, you can close the inner set of curtains; if you need complete darkness and maximum sound-insulation, you can close the outer set. Any Other Advantages to Curtains? We’ve run through many of the practical merits of installing curtains in your home, but there’s one thing we haven’t yet addressed - the way curtains look. With an incredibly diverse selection of colours and patterns to choose from, there’s sure to be a design that fits the look and feel of your room, and provides the visual accent your windows are looking for. Browse our complete collection of curtains here.